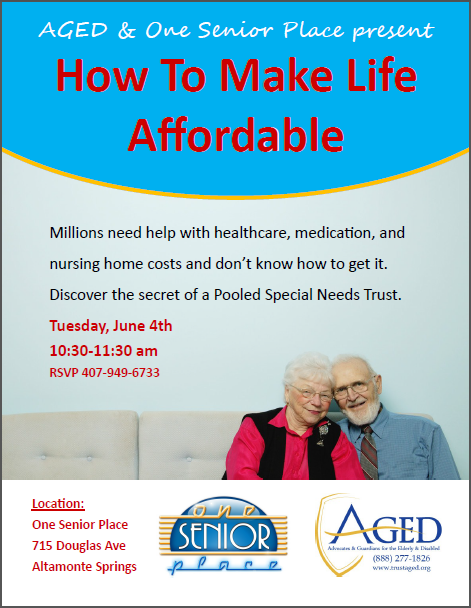 This presentation takes place on June 4th, 2013 from 10:30 a.m. – 11:30 a.m, and is open to the public. See flyer below for details. There are some great upcoming One Senior Place events that we thought you should know about. 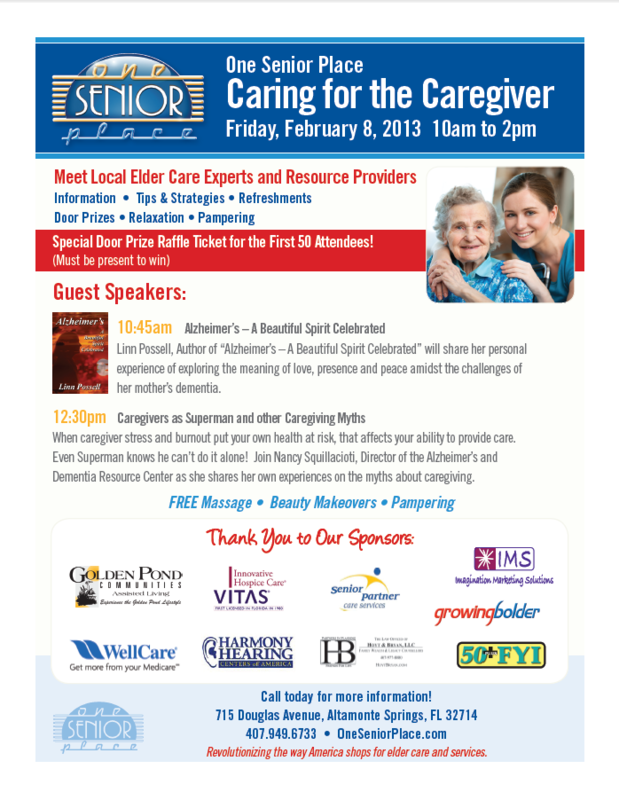 Meet local elder care experts and resource providers. 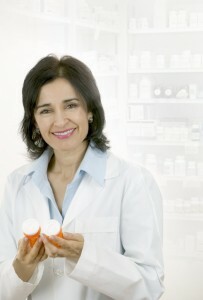 Learn information, tips, and strategies, and find resources that help. Guest speakers include Linn Possell, Author of “Alzheimer’s – A Beautiful Spirit Celebrated” and Nancy Squillacioti, Director of the Alzheimer’s and Dementia Resource Center. 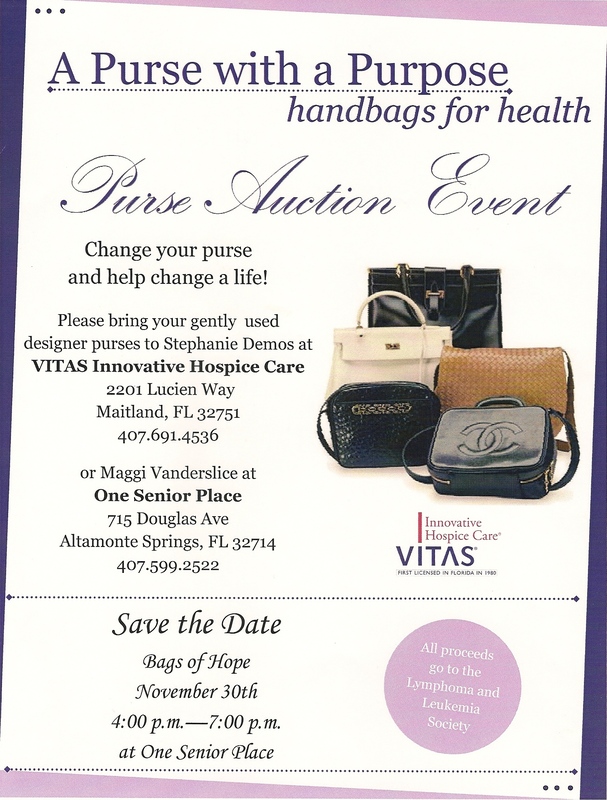 Click on the flyer to get more details. 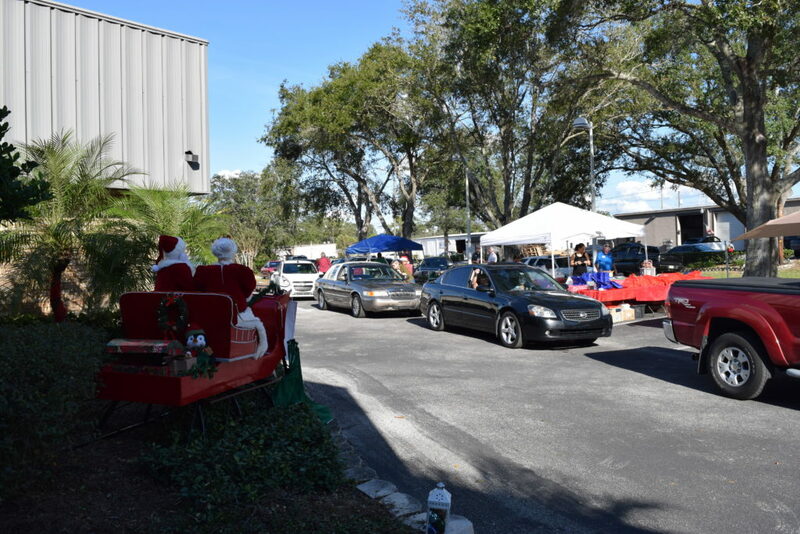 There are some great upcoming One Senior Place events you should know about. 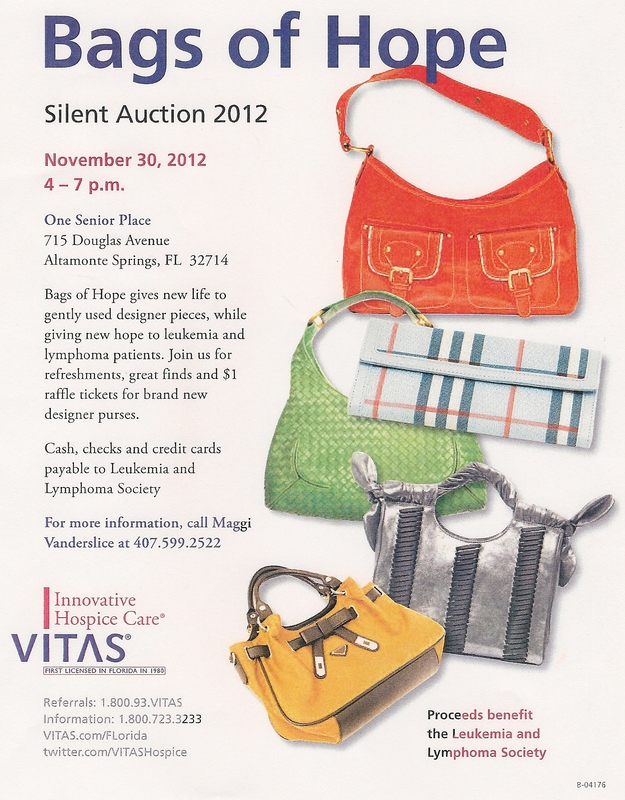 Silent Auction held at One Senior Place, with the proceeds going to benefit VITAS. 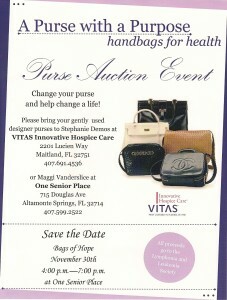 If you would like to donate a purse or handbag for this event, please check out the flyer below. 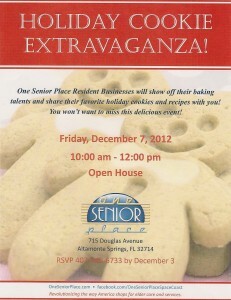 Meet the businesses of One Senior Place and pick up holiday cookies and some new recipes. On October 5, 2012, AGED and Hoyt & Bryan will be giving 2 free presentations at One Senior Place. RSVP today, as you’re not going to want to miss this valuable information. Both presentations are continuing education courses with 2 CE credits for Guardians, and 2 CLE credits for attorneys (pending FL Bar approval). To RSVP, call Tiffany at Hoyt & Bryan at (407) 977-8080, or email her at: Tiffany@HoytBryan.com. AGED is pleased to announce that we will be taking part in One Senior Place’s Healthy Living Day on September 28, 2012. Healthy Living Day will be held from 10 am – 2 pm, and will feature several guest speakers, free health care screenings, door prizes, refreshments and more. 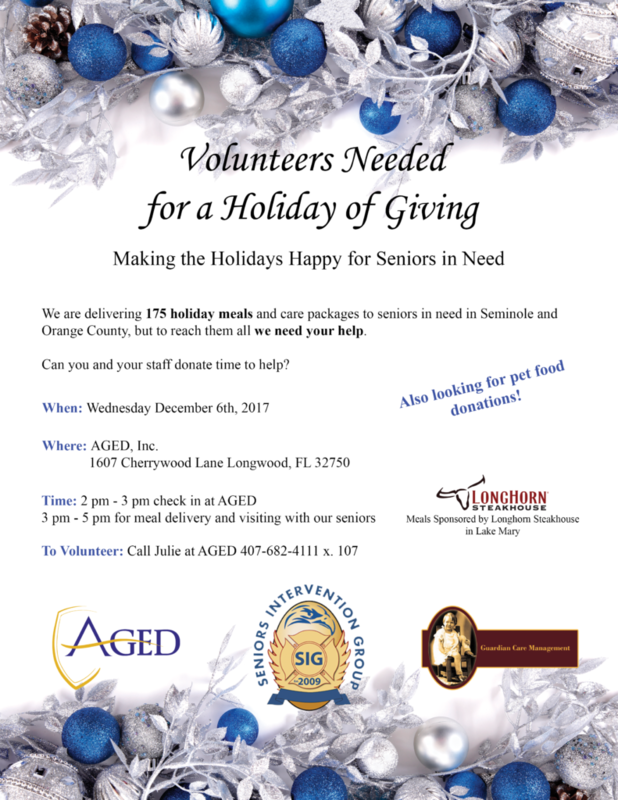 Click here to view the flyer, or visit One Senior Place for more information.